Wouldn’t it be great if there was a quick simple way to share a message with your entire network? Something for them to choose to read, nothing pushy, nothing that would be emailed to them or bug them? Well you can – it’s called a status update. 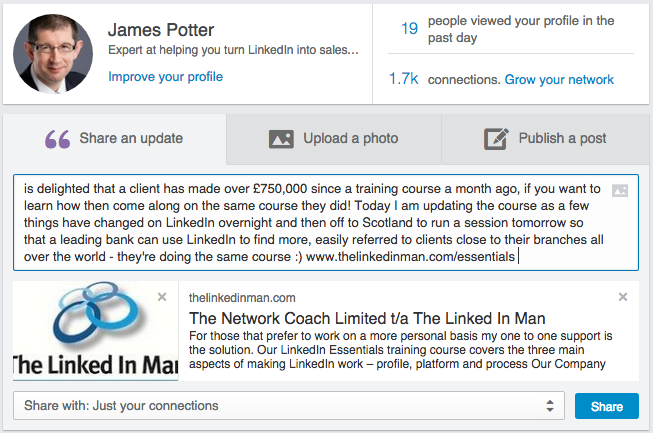 On your LinkedIn home page you can find the “share an update” at the top of your home page when you log in. If you have a photograph on your profile (and you really should) click on the purple speech marks share an update box underneath. If you don’t have a photograph then it is the purple speech marks under the white box with a grey outline in it where your photograph should be! Anything you type into this box will appear to all of the people you are connected with at level one, i.e. the people you have invited to connect or vice versa for them to choose to read. It is worth bearing in mind it automatically starts with your name so in my case “James Potter ” so remember to start with “is” or something similar or it will look odd. 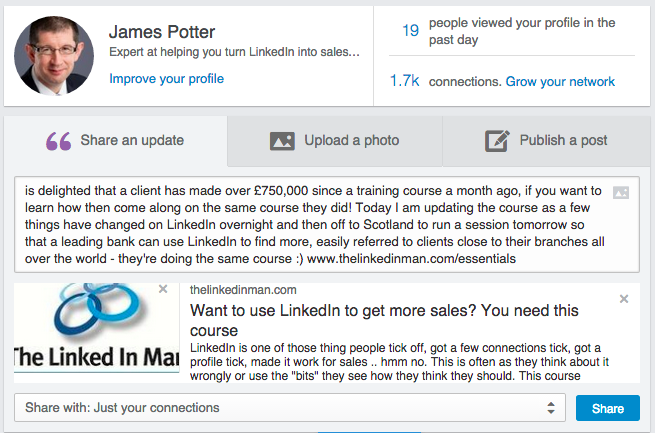 The good news is also if someone comments or “likes” your status update it gets shown to all their connections too! And all your connections can also see their comments so it starts a conversation and spreads the news. If you’re connected to 500 people and you do a status message every working day for a month, you will have impressed your value and your message 10,000 times or more, assuming no one interacts, so if people comment or like it it goes to even more exponentially. You can even click on and edit all of the text in the name and body to make it more appealing when someone views it. So if you want to keep in touch with your network, make them aware of what you are up to, the value and range of products, services and expertise you offer start talking to people using your status updates.